Godiego (ゴダイゴ Godaigo) are a Japanese rock band, consisting of pianist and composer Mickie Yoshino, vocalist Yukihide Takekawa, guitarist Takami Asano, bassist Steve Fox, and drummer, American-born Tommy Snyder. Over their 35-year career (with hiatuses), Godiego released 25 singles and 55 albums in Japan, with lyrics written variably in English by longtime collaborator lyricist Yoko Narahashi. They are perhaps best known for performing the song "Monkey Magic" for the 1978 television series Saiyūki which was brought over to the United Kingdom as Monkey. This led to several releases through BBC Records, including "Monkey Magic", "Gandhara", and the LP Monkey and several of their records charted in the UK. Their theme from The Water Margin was their sole UK Top 40 hit. 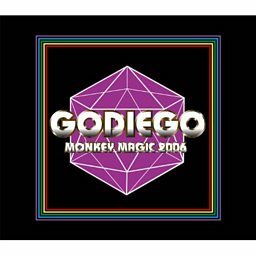 Godiego are also known for performing the theme song "THE GALAXY EXPRESS 999" for the Galaxy Express 999 film and the soundtrack for the 1977 film House. They were the first rock band to play in the People's Republic of China and Nepal, and inspired the name for the band Monkey Majik (the group's original drummer was British and watched the show as a child). Lead guitarist Takami Asano worked on the soundtrack of the Nintendo DS game Shin Megami Tensei: Devil Survivor, while vocalist Yukihide Takekawa composed the soundtrack for the Super NES video game Soul Blazer.